Filbar Friday final offering for June is AS4 - Simian’s Gate. This high level adventure returns the PCs to Helvana. A recent adventure has netted the party some Adamant, a rare ore in Filbar that is excellent for constructing weapons of amazing quality. As you arrive in Vorshmorgan to locate a smith you quickly discover there are problems in town. The scenario was designed to give upper level players a challenge and pits them against one of the most feared creatures in the land! This adventure setting was designed for 5th Edition AD&D for the Filbar Campaign for a 4-8 adventurers of 14th – 16th level and a DM. This adventure is easily adaptable to most any game and system. Save yourself some time and utilize it for a one shot adventure or a continuing campaign! 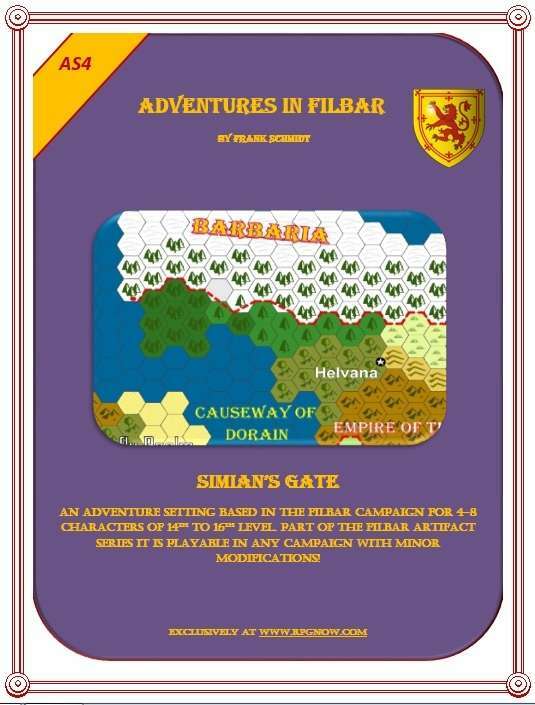 Don’t forget to follow us on Twitter @FilbarRPG for news and offers! Dieses Produkt wurde am June 24, 2016 in unseren Katalog aufgenommen.